Along its 32 mile length, the Brenig Way meanders through a stunning landscape that is made up of a tapestry of assorted habitats. The trail goes through many secluded valleys whose sides are draped in ancient oak woodlands. Such woodlands can boast a wide array of wildlife throughout the year, but it is in early Spring when they are at their best. Dappled sunlight has the opportunity to filter down and reach the ground layer allowing wildflowers to burst into life. 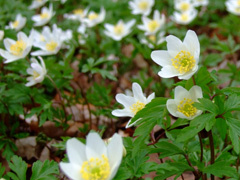 Species such as wood anemone, lesser celandine and bluebells make the most of this sunlight and produce a luxurious carpet of colour to the woodland floor. As the season progresses, the woodland canopy closes in and less light can reach this ground layer. However, this canopy produces shelter and protection for numerous woodland birds that breed here. 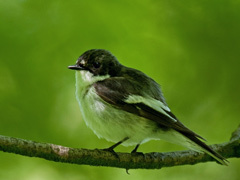 Species such as pied flycatcher, wood warbler and great spotted woodpecker are amongst those that you might be fortunate to see and hear. In stark contrast to the shaded woodlands are the open fields and meadows that are to be found along the course of the Brenig Way. Buzzards are often seen soaring overhead and if you are fortunate, you may even see a red kite, a species which is making a welcome return to the area. Some of the meadows are particularly herb rich with species such as field scabious, birds foot trefoil and vetches which provide nectar and pollen for a variety of insects and butterflies such as ringlets, meadow browns and small coppers. Areas around the valley floor are made up of quite wet ground and contain wet flushes streams and rivers. In such places you might be lucky to hear the unmistakable call of the curlew which is quite common along the length of the trail. For much of its duration, the Brenig Way follows streams, rivers and Llyn Brenig itself. These aquatic habitats are brimming with life. 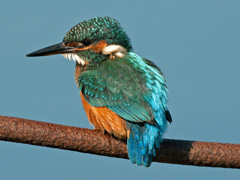 You may well be lucky enough to see a kingfisher perched on a post or branch as it scans the river for a small fish, but it is usually seen as a blue flash as it speeds up and down the river. Areas of fast flowing water and bankside cover are favoured by the dipper and grey wagtail. The dipper has a white breast and its easy to see where its name comes from! One theory put forward as to why it 'dips' is as a form of communication. As they are usually found on sections of fast flowing rivers, the noise can easily drown out its call, therefore a bobbing white breast serves as a way of communication. There are also several species of dragonflies and damselflies. One to look out for is the easily recognised beautiful demoiselle with its distinctive dark wings and effortless fluttery flight. Otters are on the increase across north Wales and healthy populations exist within the area. They remain elusive though and often the only way of determining their presence is by detecting what they have left behind – in the form of footprints or spraints. The Hiraethog area that includes Llyn Brenig and Clocaenog Forest is home to a wide diversity of wildlife. It is recognised as the stronghold for red squirrels within Wales but you would be very fortunate to see one as they spend the majority of their time high up in the tops of the trees feeding on the seeds of conifer cones. The forest is home to a wide variety of bird life. 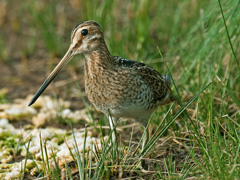 Species such as crossbill, siskin, woodcock and snipe are all common here. A huge amount of management has taken place here for the benefit of wildlife and in several key locations, the forest has been thinned and managed to allow moorland species such heather, bilberry and cotton grasses to return. Within these areas the threatened black grouse can be found and there numbers are gradually increasing in north Wales with Clocaenog recognised as one of the key areas for this species. All in all, there is great diversity and richness to the whole area and for most of the Brenig Way, you’ll always have company in one form or another!